This is the 5th Edition of our best-selling core Java book. Since 2001, it has been used by thousands of beginning and experienced programmers to master the core Java skills that are needed to create desktop, web, and mobile applications. Now revised to cover Java SE 9 and updated throughout, it focuses on today’s best practices, including using an IDE for all phases of program development …a professional practice that most other Java books ignore. I love your Java book. It cuts right to the essential information, providing the perfect balance between too many details and too little information. I bought another well-known Java book, but I spent several hours trying to learn what I learned from your book in about 45 minutes." You’ll be writing your first complete Java applications at the end of chapter 2! By the end of chapter 5, you’ll know how to use Java classes, objects, and methods to write bulletproof applications that use custom methods to validate user input. That gets you off to a fast start in Java whether you’re a beginner or have years of programming experience. Starting from chapter 1, you’ll take advantage of the time-saving features that an IDE provides as you use NetBeans or Eclipse to create, compile, run, test, and debug Java applications. The book itself shows how to use NetBeans, but there’s a PDF in the free download for this book that shows how to use Eclipse. Section 2, on object-oriented programming, cuts through the mystery of encapsulation, inheritance, and polymorphism so you can learn how to create and use sophisticated business and data access classes. It also shows you how to use two new features of Java 9, the module system and Project Jigsaw, to develop truly modular classes that are easier to use and deploy. At the end, you’ll know how to develop real-world, object-oriented, business applications. In section 3, you’ll learn more of the core Java features that you’ll use all the time, like how to work with arrays, collections, generics, strings, dates, times, file I/O, exceptions, and more! Each chapter in this section is independent of the others, so you can add these skills to your resume whenever you need them. Section 4 shows you the basics of using the JavaFX and Swing APIs to develop attractive graphical user interfaces (GUIs) that handle events and validate data. JavaFX is newer and offers more advanced features, but Swing has been popular for years and is more widely-used. To complete your OOP training, section 5 shows you how to write database classes that map objects to a relational database. First, you’ll learn how to use SQL to work with SQLite databases. Then, you’ll learn how to use JDBC to work with any database. Section 6 adds to your professional skills. So you’ll become proficient with the two most exciting features of Java 8, lambda expressions and streams. And you’ll learn how to use threads to make your applications run more efficiently. This book is a favorite among developers who are moving into programming Android apps or Java web applications. Chapters 1-16 deliver the core Java skills that you need, whether you’re looking for a first course in Java or a refresher. Although this book covers Java SE 9, almost all of the core features will work with all previous releases of Java...and will continue to work with future releases as well. You can download Java for free from the Oracle website. Likewise, you can download the IDEs for free from the NetBeans website or the Eclipse website. Since web programming is one of the primary uses of Java, we also offer a book on web programming called Murach’s Java Servlets and JSP (3rd Edition). This book requires most of the skills that are presented in chapters 1-16 (sections 1-3) of our Java Programming book. Another primary use of Java today is developing Android apps for tablets and smart phones. So we also offer a book on that subject, Murach’s Android Programming (2nd Edition). Again, this book requires that you have most of the skills presented in chapters 1-16 of our Java Programming book. If you’re completely new to Java, chapter 1 gets you started right by giving you some background on Java and showing you how to use an IDE to create, work with, compile, and run Java projects. By the end, you’ll be ready to start writing your own Java programs. To find out how quickly and easily you can learn Java from this book, download and read chapter 2. Whether you’re a programming novice or have years of programming experience, you’ll be writing complete Java programs by the end of this chapter. All the code is provided in both NetBeans and Eclipse formats. I bought this book in October 2017 and have been using it to prepare for two of my Java classes and it has helped me a lot. Whenever I need explanation and clarification for more advanced concepts like object-oriented programming, polymorphism, and inheritance, I always referred to this book and even brought it with me to tutoring sessions. The most important thing I like about this book is that it is highly skilled-based, which is very important to beginners as other textbooks are more referenced-based and do not include complete programs. The learning process of computer programming is challenging, but this book does bridge the gap. I highly recommend Murach's programming books if you are trying to learn computer programming. 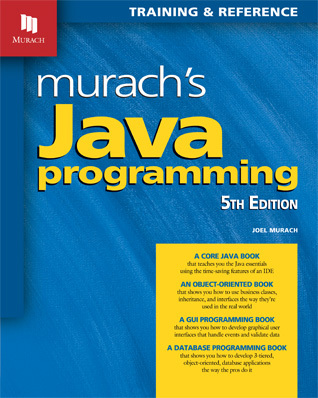 Great book for learning Java, Murach is worth every penny!